Harlem Hosts First Strokes Of Emancipation The Preliminary Emancipation Proclamation, issued 100 days before the formal document, is on display starting this weekend in Harlem. In its simplest form, the manuscript represents freedom from slavery, but President Abraham Lincoln was also trying to strike a delicate balance. 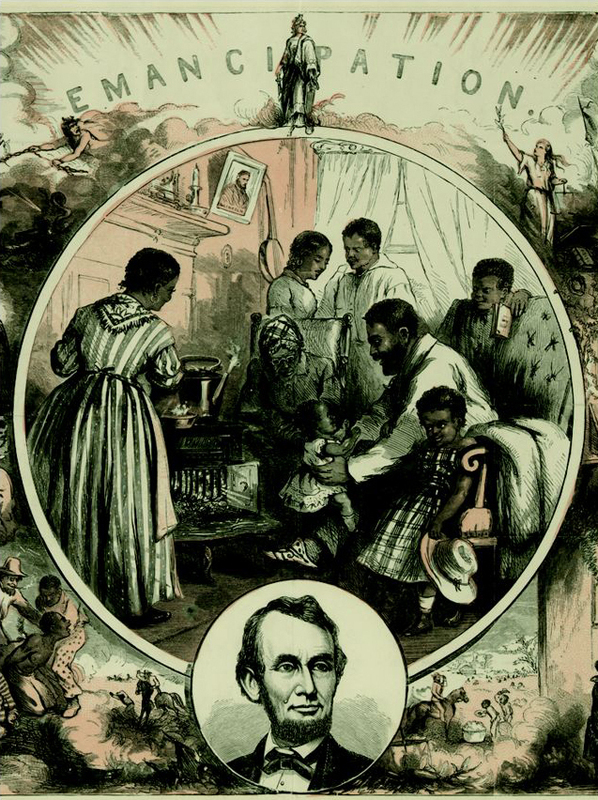 Emancipation, a wood engraving by Thomas Nast in 1865. 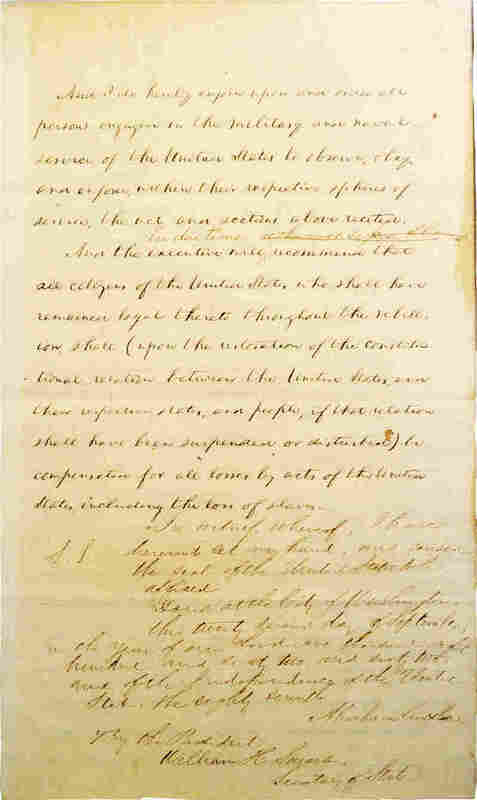 The official Emancipation Proclamation was signed in 1863. Saturday marks the 150th anniversary of a crucial moment in U.S. history. On Sept. 22, 1862, President Abraham Lincoln issued the preliminary Emancipation Proclamation, announcing his intention to free the slaves in the states rebelling against the Union. Lincoln didn't officially free the slaves in the Confederacy until the formal Emancipation Proclamation in January 1863. But he announced his intention to do it 100 days earlier, in what historians call the Preliminary Emancipation Proclamation. This official document — and Lincoln's handwritten manuscript of it — are both on tour, starting this weekend in Harlem. "There's a simple way to remember it as this moral moment of freedom. But as always with politics, there's actually a complicated history behind it," says John King, New York State's commissioner of education. He says Lincoln was trying to strike a delicate balance. He wanted to free the slaves partly to give the Union a military advantage over the Confederacy. But Lincoln wanted to do it without actually abolishing slavery. That move would have offended the border states that sided with the Union and where slavery was still legal. If you look at Lincoln's manuscript closely enough, you can see the effort he put into it, Khalil Gibran Muhammad says. Muhammad directs the Schomburg Center for Research in Black Culture, where the manuscript is on display this weekend. "Even his own struggle — the newspaper clippings cut out here, the scratched-out sentences and trying to figure out what precise language — shows us just how hard it is to do the work of making freedom and democracy real for people. This is one of those transformative moments," he says. Muhammad notes that Lincoln didn't create this moment all by himself. Throughout the war, he was hearing from generals in the field about slaves who ran away by the thousands, hoping to join the Union army. They were telling the generals, "We are here to demand our freedom. And we know you are here for other reasons, but you can't ignore us. We won't be ignored." Lincoln's handwritten manuscript didn't stay in his possession for long. It was auctioned off in 1864, before the Civil War was even over, to raise money for relief efforts. Then the manuscript was sold to the state of New York, which helped to organize the current traveling exhibition. It opened Friday with a special showing for high school students in Harlem. Senior Kamal Grant says for him, the manuscript symbolizes opportunity. "It's basically the reason we why we're even looking at it right now. Because it gave people like me a chance to even be relevant in the world," he says. Lincoln's manuscript is on display in Harlem through Monday before traveling to seven other cities around the state. On Sept. 22, 1862, President Abraham Lincoln announced his intention to free the slaves in the Confederacy by issuing what historians call the Preliminary Emancipation Proclamation. His handwritten draft, the Schomburg Center's Khalil Gibran Muhammad says, shows the enormous effort the president put into choosing his historic words. Page 1 of Abraham Lincoln's hand-written Preliminary Emancipation Proclamation. 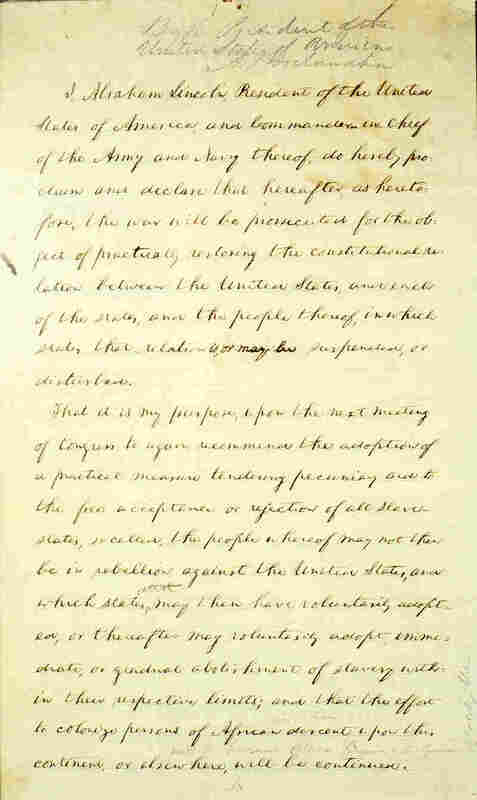 Page 2 of Abraham Lincoln's hand-written Preliminary Emancipation Proclamation. 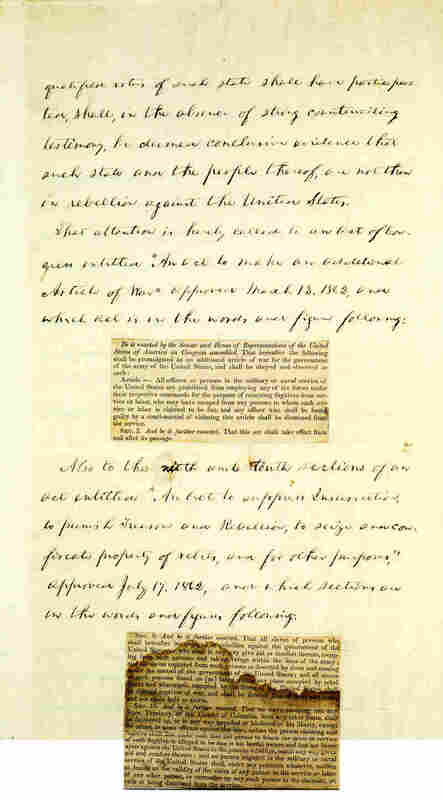 Page 3 of Abraham Lincoln's hand-written Preliminary Emancipation Proclamation. 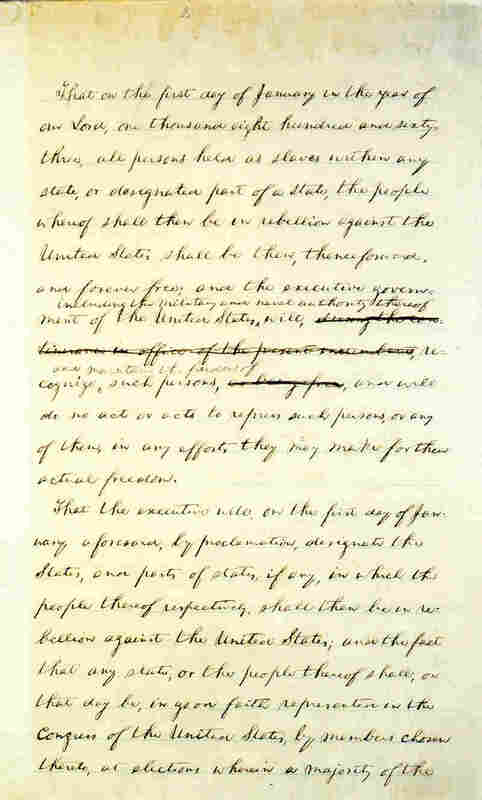 Page 4 of Abraham Lincoln's hand-written Preliminary Emancipation Proclamation.